What's the most effective way to mix a jar of natural peanut butter? Mixing it can be messy and time consuming. Aside from slowly and patiently mixing it with a knife, are there any tips and tricks to make this job faster, and without spilling? I've done this with almond butter, and I imagine it would work for peanut butter as well. The secret is to buy it a month or so before you need it, and then store it upside down for a week, so the oil traverses all the way through the jar and its contents, then turn it right way up for another week, and repeat again in each direction. Each trip through the jar mixes the oil with the solids a little more, and it's fairly homogeneous after four turns. Yes, this was always a problem for me. Stirring doesn't work because the oil spills out and its very hard to stir the bottom. The trick is to cut the peanut butter instead of stirring it. I can adequately mix a jar of peanut butter in less than 30 seconds without much effort and no mess this way. Using a butter knife, cut # shapes in the peanut butter over and over again. The idea is that gravity will naturally take the oil down if you just give it a little room. As you cut and stab at the solid chunks of peanut butter, the oil naturally mixes. At the very end you can do a couple quick stirring motions, but by now the oil and peanut butter should be mostly mixed. My husband came up with the best solution ever for this. 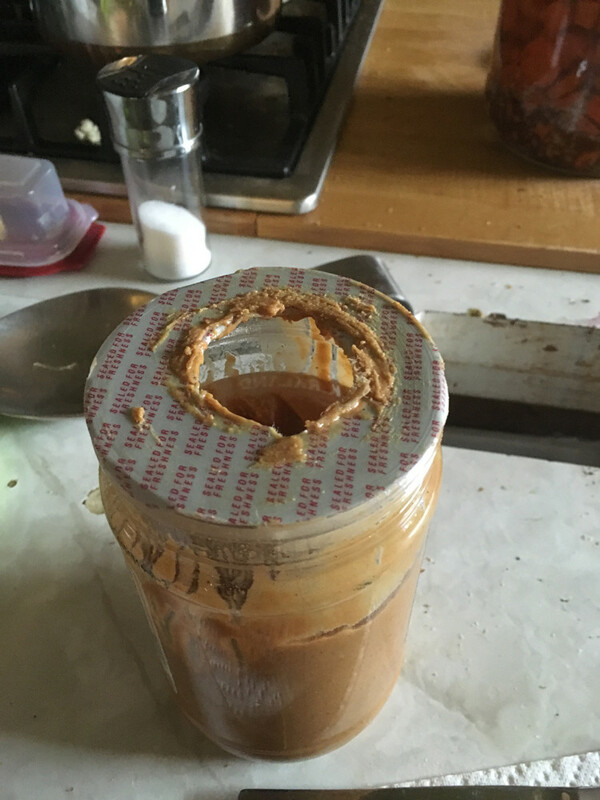 He drilled a hole in the lid of an empty jar them put 1 mixer blade from the hand mixer through the hole and voila great mixed peanut or almond butter. We now keep an extra lid with the other jars of peanut butter for next time. I found my own solution. Grab a single spiral dough hook from a hand mixer and chuck it into a power drill (corded or cordless). Open the jar and, holding it securely, turn it slowly at first so that the spiral pushes the contents downward. Once the oil is incorporating, speed up the drill and work down into the center and all around the edges (take it easy if it's a glass jar so you don't break it) to get an even mix. Once you're done, slow down again and slowly raise the dough hook out, leaving only a thin layer on it to scrape (or lick) off. Peanut butter mixers do a good job. The downside is that they are specific to the jar size. Witmer's makes a range of mixers based around the jar size/opening. You take off the lid, screw on the mixer and crank away until the peanut butter is smooth. Alternatively, you can use a rubber spatula to empty out the peanut butter into a bowl and user hand mixer (or stand mixer) to incorporate the oil back in. I would think a food processor (using the blade attachment) would work as well since you can actually make nut butters from scratch that way. I've used the Witmer peanut butter mixers that djmadscribbler mentions. In my experience, they work OK up to a point but since the agitator is a rigid piece of metal that turns, it can't reach all the peanut butter in the jar and ultimately won't do as thorough a job mixing the peanut butter as you can manually with a butter knife. You'll end up with some peanut butter that is well-mixed and some that isn't mixed at all (around the sides and bottom corners of the jar). I don't use mine anymore. You may also want to try finding a natural foods store or Whole Foods, they usually have grinders on site so you can grind your own fresh peanut butter. If you store that in the fridge (or if you use it quickly), oil separation isn't a problem. If you use one brand, take an empty jar and make a small hole in the lid. This will allow the lid to slide down a wooden spoon or similar object then screw the lid/spoon back onto the jar and mix. I pour off most of the oil into a container to be incorporated in later, and possibly not add all back in; it sometimes gets too runny with it all. (I use the extra oil to cook with later.) Now with the oil poured off, I have room to stir with a fork, and add the oil little at a time. I poke the fork to the bottom of the jar, and push the fork top around the edge of the jar in a circle. Add a bit more oil. I adjust the fork to another position when it seems to be mixed in that spot. This seems to be the best way for me. Faster than most other things I have tried. In the past I have taken 2 jars, poured off the oil, emptied the peanut butter into a bowl and used a pastry blender to cut them & add oil back til it seemed enough. The reason I do 2 is because I hate to dirty bowl, pastry blender, spatula, etc. for just one. Peanut butter keeps very well. I will do my almond butter or other types I may have in the same bowl after I finish the peanut butter. It's a bit less messy to stir if most of the inner seal is left on and stirred through a center hole. It is also wise to store unopened jars lid down; this minimizes the amount of oil which collects just under the lid. Am no expert, but this worked for me. Truth be told, I'm kind of proud of myself, as kitchen duty is not my strength. It was easy and easy clean-up as well. You will need three things: 1) a stainless ice cream scooper (the old-fashioned spring-loaded release kind) 2) a stainless saucepan or stainless or glass bowl, and 3) a stainless steel hand blender (the kind used to mix soups while still in the pot (cuisinart). I used the ice cream scooper to empty the contents of the cashew nut butter into the stainless saucepan. Then, I mixed it, using the hand soup blender (as if I were blending a soup). 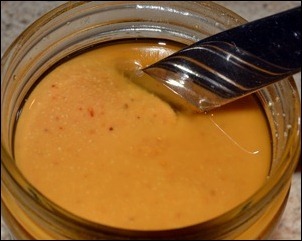 Next, I again used the ice cream scooper to return the (now mixed) cashew butter to the jar. I mention stainless and glass, as they are so easy to clean. But, am guessing plastic bowls will do as well. GOOD LUCK! Microwave jar (without metal lid!) on level 3 or 4 a minute or so, repeat if needed throughout the mixing. Stir with a narrow bread knife - reaches easily to bottom of jar, is thin and flexible, and the bladed side is great for breaking up large lumps at the bottom. Mixers are very effective, however when you add up the time end effort it takes to clean a mixer bowl and attachment it's usually is the same as if you just mixed it up with a knife. I haven't found a better way personally. Buy one or two jars ahead depending on how much you eat. As stated earlier leave stored upside down. Once a week shake the jar(s) vigorously still upside down. Even if you forget the harder blob will be at the lid and overall easier to deal with. Someone mentioned microwaving it or running it under hot water. Living in the Phoenix area, I have discovered a really easy way (but it only works well in places where it's hot.) Just buy it one day, leave it in your car all day (and all night if hot enough.) When you go to take it out, it will be easy peasy to stir it. I store the nut butter upside down. When all the oil is on the upturned bottom, shaking to make it rise, I use ONE beater attached to my hand mixer. I then store it in the fridge. This has worked well for me. 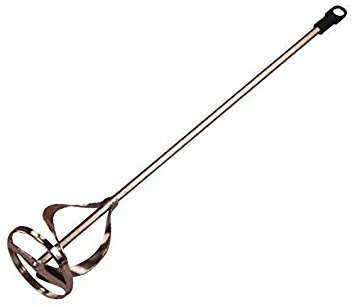 I may try the pastry brush attachment for my mixer for the larger sized jars. 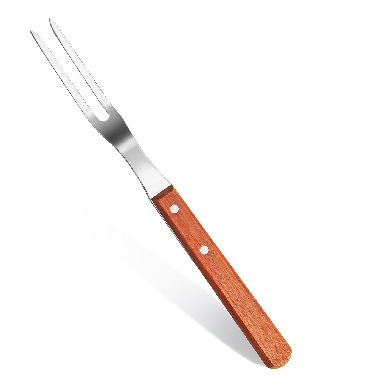 I've been using a BBQ fork with twisting/turning motion instead of a mixer. And it's an easy cleanup to boot. I just tried pre-heating the jar in the microwave and that idea is a slam-dunk! It made the mixing job SO much easier. Just beware - if you have a jar that's sealed with some sort of foil you have to get every bit of it off the rim of the jar or it will catch fire in the microwave! Adam's PB is great and does not have the foil seal. IMO all the recommendations that talk about emptying the jar into a bowl end up with too big of a cleanup job. I use one beater and a hand mixer. Taller jar leaves a bit un mixed on the bottome, perfect for midnight snack & no drips. Empty the peanut butter jar into a 4 cup measuring cup or bowl. Mix with whatever is appropriate - spoon works well - until oil is combined, then spoon back into the original container, use a rubber scrapper to get the last bit (clean with fingers and take a taste now and then). Then put it in the fridge to keep it together. remove lid, use egg beater. Takes 2 or 3 minutes. That is all. Slide it into a bowl and mix it with a hand mixer. Spoon it back in the jar and refrigerate. I’ve tried wrestling with the jar itself—way more time consuming. And I toss the bowl and the beaters into the dishwasher. We have a lovely hand-held mixer with adjustable speed that came with a pair of spiral blades, it fits perfectly in a 16oz Crazy Richards jar. We first place the blades all the way in, then using the lowest speed we rotate the jar until done, then lift the mixer up slowly until the hook ends start to appear. Turn the mixer off before going any farther! Go to the hardware store and buy a new paint stirring rod for your variable speed electric drill. Most are 1/4" drive, and have 4 blades. At a slow speed work the paint stirring bit into the solid peanut butter. Increase the speed, and whip it to your heart's content. Wash and store your "peanut beater" with your other whisks. Turn the jar upside down (at room temperature) for about a day. Let gravity do the rest. The oil will try to start rising to the "top" again. Turn back over when it has self mixed and refrigerate to keep it in its newly reconstituted state. Use a fork. Start by stabbing up and down. Not the answer you're looking for? Browse other questions tagged peanut-butter or ask your own question. Why has my recently bought peanut butter such a liquid consistency? How to spread peanut butter that is required to stay refrigerated?